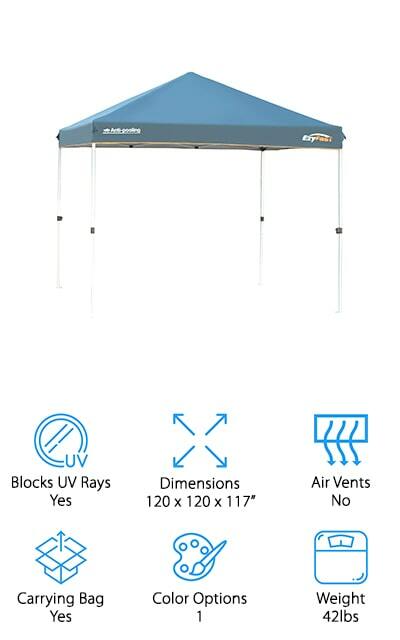 Whether you’re taking a long family vacation on the beach or you’re setting up a merchant tent at a fair, you’re going to need a beach canopy. These shelters can take your day from miserable and hot to cool and comfortable no matter what you’re doing. We’ve compiled a list of the best beach canopies for all of your endeavors. Here are some things you should keep in mind while you’re shopping. Blocks UV Rays: A canopy that blocks UV rays can be the difference between a hot day with sunburn and a cool, shady day where you can relax. This will tell you if the canopy is made to block harmful rays. 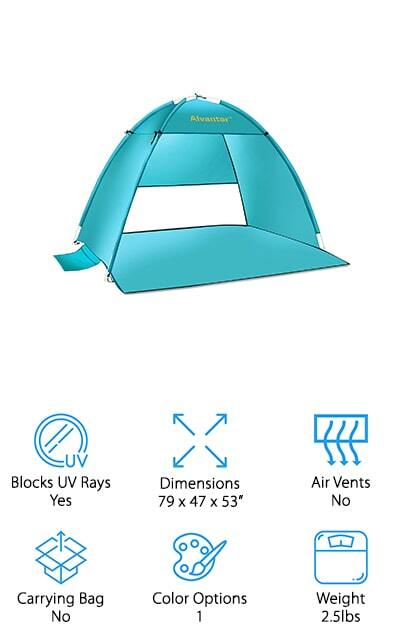 Dimensions: How big is the canopy? This is especially important when you’re looking for a place to set up, or booking a space at a fair. You need a canopy that’s going to fit in the space and hold your equipment. Air Vents: The air vents are usually located at the top of the canopy and can help circulate air within. This is important if the canopy has a wall or other construction that closes it off because it can get really warm. Carrying Bag: Does it come with a carrying bag? This is going to be important if you take it to a lot of events or beaches. A carrying bag will save you space and hassle. Color Options: How many colors does it come in? This is a personal preference, but some canopies on our list come in a huge variety of colors to help personalize your experience or stand out in a crowd. Weight: How much does the canopy weight? If you’re going to be toting it around a lot, you need to know if you can physically carry it. This will help make your life a lot easier, so we’ve included the information. With that said, we can take a look at some beach canopy reviews. We’ve done a ton of research in order to bring you canopies that will suit your needs, whether that’s surviving in high wind conditions or shelters for large outings. Our top pick and budget pick are highlights, but some of the best canopies come later in the list so stay tuned and check out the rest of the list. The best beach canopy for family setups might just be the Coleman Instant Canopy. This shade sets up in about 3 minutes and includes only 3 easy steps to get out of the sun. It provides great sun protection via its UVGuard material that will keep the sun off of your face while you’re relaxing. The vents in the room are 2-way vents that help keep air circulating freely inside the shelter. The poles are pre-attached and feature comfort grips so that the shelter locks into place. Plus, it comes with a carrying bag so that you can pack it up and transport it easily. The poles telescope out so that you never have to reach over your head while setting it up. You’re still going to need two people, but you can get this shelter up without any additional hassle. We love that it’s only 35 pounds and easy to transport. That’s a huge perk. 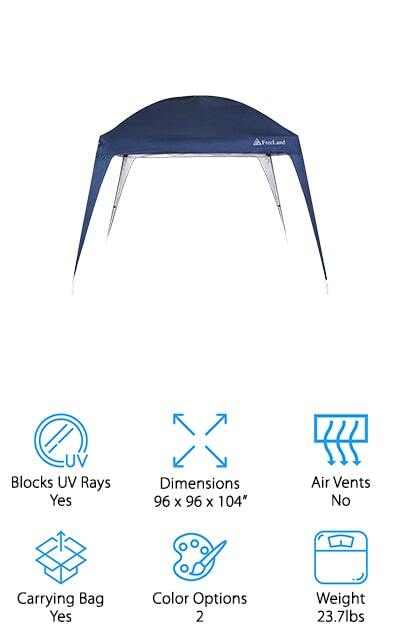 This lightweight canopy by Sport-Brella is also an inexpensive alternative if you’re looking for a smaller place to spend your days in the sun. This sun canopy consists of a large umbrella with side walls and air vents that’s perfect for setting chairs on at the beach. The cover is durable and provides all-weather protection, including UPF 50+ to keep the sun away. The wind flaps give you excellent ventilation and airflow throughout the cover. The windows also give you a great view of your surroundings. It comes with an easy-to-carry bag which you aren’t going to mind hauling around at all because the umbrella weighs all of nine pounds. That’s one of the lightest on our list, so it’s definitely the most portable cover. For windy days, use anchor cords and ground stakes, and you can even use the pockets on the side to hold sandbags. It’s a great wind resistant beach canopy for the whole family. Eurmax makes this 10-by-10 foot commercial canopy that pops up in no time at all. It provides about 100 square feet of shade underneath, which is plenty if you’re using it at a fair or market. 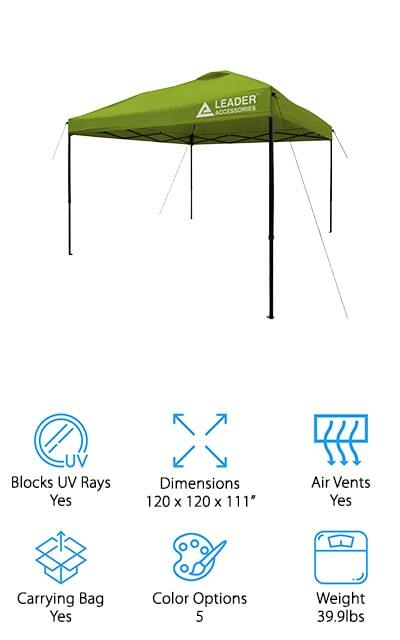 It includes a roller bag so you don’t have to heft 60 pounds of canopy around with you, and includes both stakes and guy ropes for those windy days. This canopy can stand up to some wind off the water when you take it to the beach, especially when you guy out the lines so that it’s more stable. This canopy comes in 20 different color options, some of which are striped. They are all vibrant and fun and all effectively block UV rays. The cover is also waterproof so it won’t get ruined on the beach. The legs are even coated with a powder rust-resistant finish to keep your canopy in great shape no matter how you’re using it. This 10x10-foot Crown Shade comes in three different colors: black, this blue, and white. It has a straight-leg design so you know it’s going to have the same dimensions on the top as it does on the bottom. It provides about 100 square feet of shade coverage and can sit between 4 and 6 people underneath. You can adjust the height with the help of three other people by pressing the buttons on the legs and raising and lowering the height as you see fit. 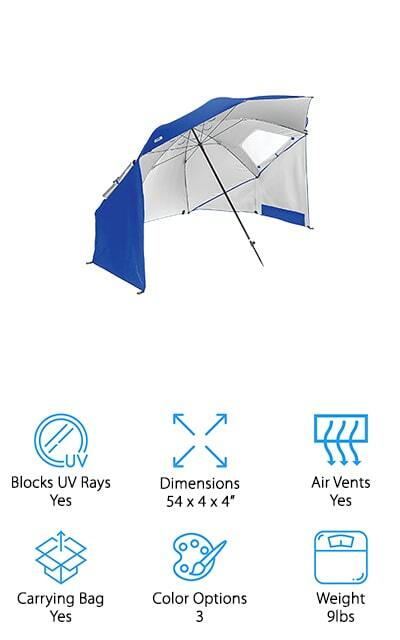 It has a sturdy steel frame construction, and the top of the canopy is water-repellent and contains sun protection up to UPF 50+. The canopy itself is made of 150D oxford fabric, so it’s lightweight and keeps the sun right where it belongs – off of you! It includes 4 guy lines as well as eight stakes, and that makes it one of the best wind resistant beach canopies that we could find during our research. The CORE Pop-up canopy is a great investment for a family that loves to head to the beach all the time. 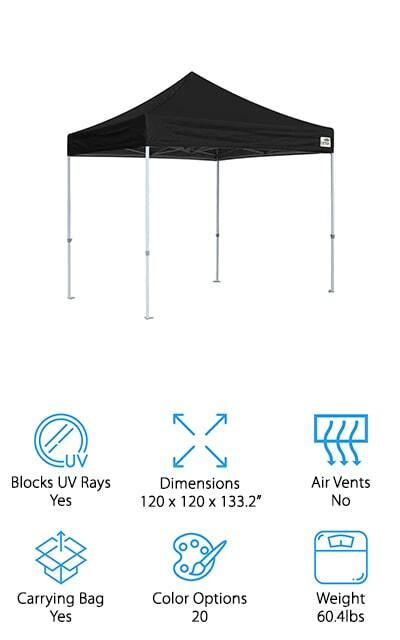 It can be set up instantly in under two minutes, and the 10x10 dimensions allow you 100 square feet of cool shade even on the hottest days. This is achieved by including a canopy that has 50+ UV protection, so it stops the sun’s rays before they get into the cover. There are two vents in the canopy to promote additional circulation, and we love that it's gonna feel cool inside rather than stifling. The buttons to help keep it on the frame are large and oversized so they don’t get at your fingers during setup. 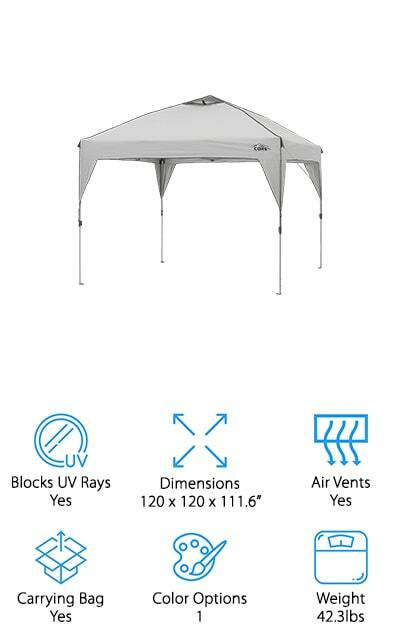 The portability of this canopy and the included bag make it a great shelter for camping, festivals, and even backyard events. Use it to set up shop at a fair and head to the beach the next day. This is a versatile cover! EzyFast makes the first beach canopy on our list that includes anti-pooling technology. This makes sure that water will run off of the canopy when it rains rather than pooling and pushing the canopy in. The extra weight from rainfall can sometimes snap leg poles, so this is a great perk. The roof is umbrella style, so it gets a ton of all-around support. It’s a one-piece frame that’s easy to get up and to take down. With help, you can get this canopy up in a matter of minutes. Who wants to take more than that, anyway? The tallest peak height is almost ten feet, but there are three adjustable positions lower than that, so you can put it at your choice of height. The canopy is made of 150D oxford weave so it’s water-resistant and all of the seams are taped so it won’t leak in on you if it starts to rain. This shelter by Lightspeed is one of the best beach canopies for wind. That’s because it includes a detachable wall that you can move around the cover as you’d like, or completely take it down if you want complete ventilation. The fiberglass poles bend well in the wind, so it’s sound when it’s completely set up with the guy lines and stakes in place. You can use sandbags for further wind protection, and no amount of gust is going to keep you off the beach. We love how spacious this cover is, even if it’s a little shorter than some of the other canopies. It’s a great beach cover and that’s what matters. We love that it stays right where it’s supposed to even with the wind gusting. Plus, it comes with a carrying bag so it’s easier to move from place to place. It’s easy and quick to set up as well, and that’s great! 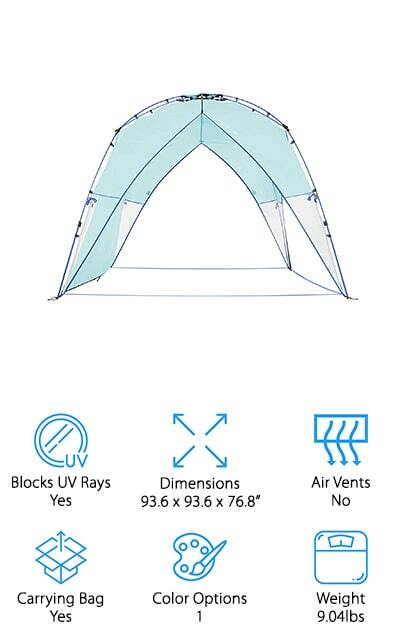 The first thing that stands out about this amazing Alvantor beach tent is that it’s incredibly lightweight. At only 2.5 pounds, you aren’t going to mind carrying this thing around at all. The frame is made of fiberglass, which is exceptionally lighter than steel while still being durable and reliable. These poles are going to keep their shape even after a ton of use. It won’t rust or break easily, and it bends with the wind. The cover is 50+ UV protection and water resistant so it makes a great shelter for a sudden rainstorm. It also takes about half a minute to set up, which is more time on the beach and less fiddling with equipment. You can use it at the park, the lake, while camping, or even while hiking. It’s light enough to function as a through hiking cover. That’s pretty amazing, and might be a game changer for some outdoorsmen. It’s pretty amazing. Freeland makes the only pop-up canopy on our list with a rounded roof design. It also has slanted legs so that get more stability in the long run. When you’re planning a festival or headed to the beach, you will be happy to have your pop-up canopy along. It includes a carrying bag to take with you wherever you need a cover, as well as wind ropes (or guy lines) to provide additional stability in light winds. 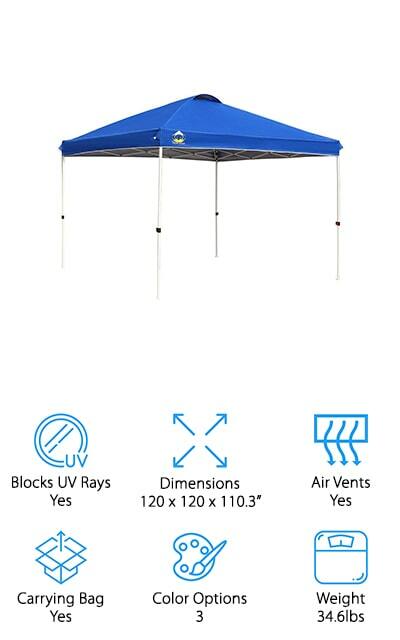 If the wind is heavy or it rains for a long time, you should pack this canopy up. It’s ideal for sunny, breezy days, though! You can use it during recreational sports activities such as kids’ soccer games. It provides about 64 square feet of shade, so it’s a great single-family shade for camping or parties. There are two different adjustable heights so you can choose the one that works best for you. It also blocks 99% of UV rays, which is amazing. Leader Accessories makes one of the best beach canopies for high wind conditions. 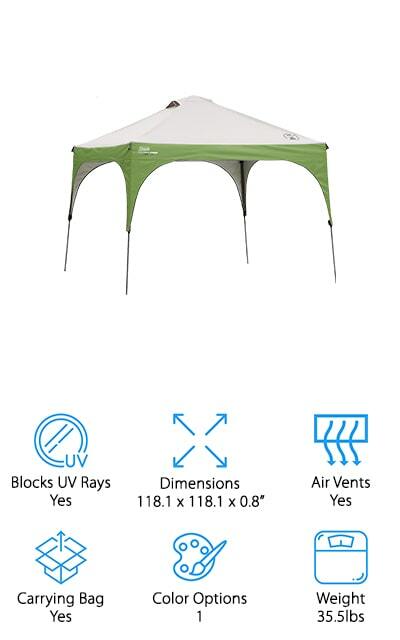 This canopy is sturdy and stable, and you don’t have to do much to get it to stay that way. The frame is powder-coated steel, so it’s unbendable in high winds. The one-piece frame holds together well and you won’t slip a pole in the middle of the day. It provides 100 square feet of cooling shade for recreational activities, outdoor events, and even for markets and fairs. It’s ten feet tall in the center, so you’ll have plenty of room to walk around or to display things, depending on how you use it. If you need it shorter, you can adjust it to three different height settings. The canopy itself is protected against UV rays with UPF 50+ so it reliably keeps you cool. It even has a silver back for additional heat reflection. This canopy has everything you could need!